Happy Insights empowers you to quickly and easily query your data, with simple drop down filter options and no need for SQL knowledge..
1 . Click the Filter button on the Field in the Dimensions and Measures column. 2 . In the Results table, click the Cog icon in the column heading. ‘Equals’ and ‘contain’ filtering options are fairly similar but can skew your results significantly if not used properly. Equals is best used when you are looking for a specific result for a field. 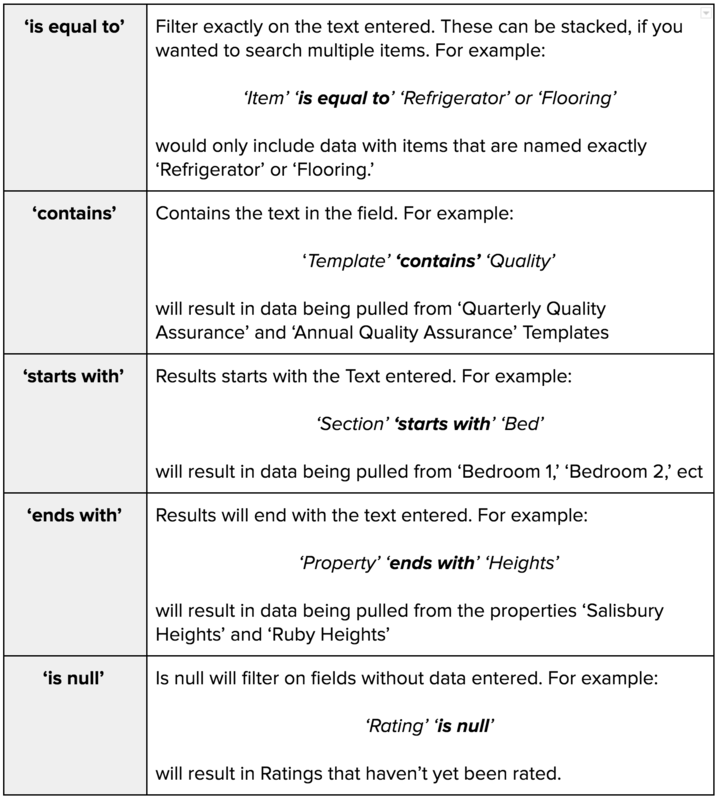 Let’s say you are looking to pull data on the condition of the ‘Pool’ line item, and you have a deep understanding of your data and line items, it may be best to use ‘equals’, as ‘Pool’ is a fairly generic descriptor, and your team may be inspecting items around the pool as well. If you are looking for a wider look at the pool area overall, you could use ‘contains’ to cast a wider net. For example this could pull up data containing ‘Pool,’ ‘Pool Filter,’ ‘Pool Fencing,’ and ‘Pool Water Levels’ line items. There will often be times where you will want to filter data across multiple fields, for these times you can use the ‘Or’ filter option. Let’s say you are looking to query multiple items, this would be a good example of when you will use the ‘Or’ filter. You can use the ‘Or’ feature by clicking the ‘+’ icon to the right of the field, this will add another blank field below, which you can use to cross reference multiple fields.